A Brooklyn, NY brownstone with blacked-out windows is more than meets the eye, as it hides a subway vent and emergency exit stairway. City infrastructure might seem cut-and-dried on the surface, but digging deeper can often reveal more than meets the eye. Deep beneath streets lies a labyrinth of tunnels, pipes and cables that keeps a city functioning. But sometimes necessary infrastructure is hidden in plain sight at the street level. Certain "hidden" infrastructure is rather well known. For example, cell phone towers disguised as trees, some of them clearly not fooling passers-by with their attempt at spindly faux boughs, and others providing such great camouflage that they might cause a seasoned arborist to do a double take. Cities and transit agencies also disguise certain transit infrastructure elements. Some of the structures are so well executed that citizens living among them might not immediately be aware that they’re merely a façade. In a posh London neighborhood, a quick glimpse of 23 and 24 Leinster Gardens simply seems to show two typical structures in a row of well-maintained homes. But a closer look reveals that the doors have no handles and the windows are not glass, they're merely painted on. A view from the back exposes the structure's dirty little secret: It is not a complete building at all, just a faç​ade on the front that hides a huge gap in the rear. 23 Leinster Gardens (the right-hand unit) is a façade, with "windows" painted grey. The homes that existed at this spot were demolished for an underground railway route that opened in 1868 and it serves as a subway vent. The faç​ade was constructed to make the vent space blend in with surrounding homes. Similarly, a false-fronted "home" serves as a subway ventilation chimney at 145 Rue Lafayette in Paris' 10th Arrondissement. Just as with the London example, the home that previously stood at this space was demolished and a faç​ade was constructed to keep up appearances. Camouflaging transit system vents with fake buildings isn't just a late-19th century European phenomenon; the United States got in on the action, too. On a typical tree-lined street in Brooklyn, the brownstone at 58 Joralemon Street sports dark windows — always. The structure hides a subway vent and emergency exit stairway. The faç​ade of 58 Joralemon Street. Passers-by might not be aware of the Joralemon Street vent-hiding structure, but it is well known to historians. 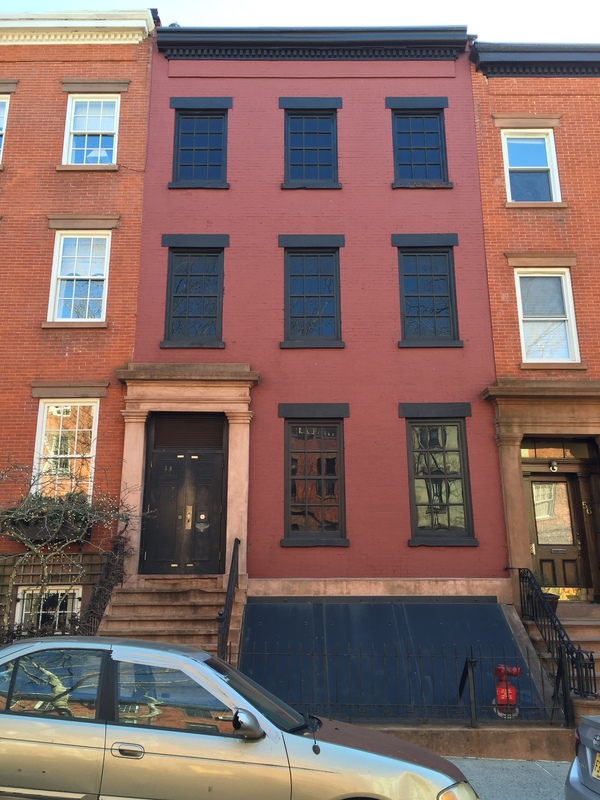 The city's Landmarks Preservation Commission told Smart Cities Dive that the Greek Revival rowhouse was built in 1847 and converted as part of a subway vent fan plan in 1908. The Brooklyn Historical Society directed Smart Cites Dive to an old, local publication, The City Record, which in 1906 posted a letter from the chief subway tunnel engineer that discussed creating a subway vent. He explained that vents needed to be constructed in both Manhattan and Brooklyn to provide an adequate fresh air supply to keep subway tunnels under the East River safe for public use. He noted a proposal to build exhaust grates at a shaft near a new high-pressure pumping station "which is now being constructed at the foot of Joralemon Street." A cross-section illustration shows the plan for the subway underneath the river and the associated ventilation shafts. Articles from The Daily Eagle in July 1907 mentioned that the ventilation shaft on Joralemon Street was nearing completion, as was the vent on the Manhattan side. Pictures in the newspaper show construction at a gaping hole that stretched about five-stories below ground level while the neighboring residences remained untouched. Despite the plethora of information the Brooklyn Historical Society has access to regarding the vent construction, its historians and those from numerous other New York organizations have difficulty answering a pressing question: Why? A representative from the New York Transit Museum, a self-supporting division of the Metropolitan Transportation Authority (MTA), told Smart Cities Dive the house at 58 Joralemon Street was purchased by the predecessor agency to the current MTA and gutted for the vent project, rather than being completely torn down. MTA renovated the structure in 1999, including upgrades to the decades-old ventilation machinery and improvements to the façade. But the scores of records available to historians are less clear about why engineers deemed this exact residential spot as ideal for building a subway vent and consequently gutted the home. MTA could transform the oddity into a bona fide tourist attraction, perhaps even charging a small admission fee for a peek at the inner workings of the unusual ventilation structure. But The New York Times reported in 2004 that the agency chooses to keep the site "incognito for security reasons," yet, the so-called "Shaft House is an open secret to its neighbors."